Let’s just get this out of the way. I love shoes. I even named my blog after them. I have way too many shoes because, well, I need shoes to walk in, to drive in, to strut in, sometimes all in the same day, which means I want shoes for each function in matching colors. Pumps, stilettos, sandals, ballet flats, boots, tennis shoes, oxfords, loafers. If I had the space, my shoes would have their own room. Maybe even their own palace. But just because my shoes could fill a room doesn’t mean they fill my head. 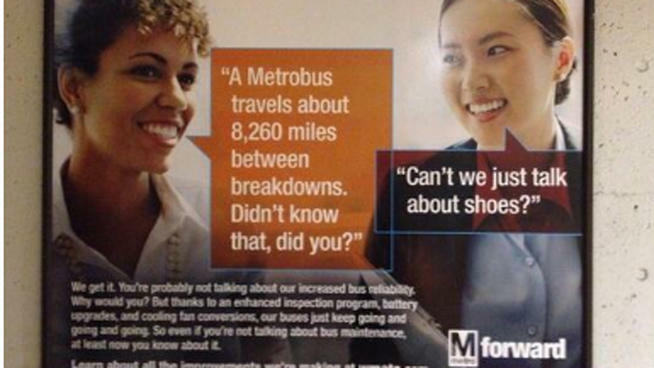 A recent ad in the Washington, D.C. metro system implied that women don’t want to talk about boring stuff like metro reliability – even though it has a direct effect on getting to work on time to make money to buy those shoes – because all they want to talk about is shoes. The women I know, young and old, love to talk. About parents, children and friendship. And healthcare. And poverty. And music and twerking. And gay protest music in Russia. And how to stop hunger, cruelty to animals, and honor killings. And yes, about shoes. But anyone who thinks it’s cute to diminish us by implying we ONLY talk about shiny, decorative things because we are shiny, decorative beings? They just don’t get it. Maybe they need to walk a mile in our shoes.